Blackpool boss Ian Holloway called for referees to be allowed to use video replays after "three wrong decisions" in their 3-2 defeat by Manchester City. Holloway questioned both Carlos Tevez goals for City and claimed his side had one wrongly disallowed. "(For) our goal, Elliot Grandin was offside but it went to Gary Taylor-Fletcher and he scored," said Holloway. "Their first goal, Tevez was offside, and the second one was a foul on my defender, absolutely blatant." 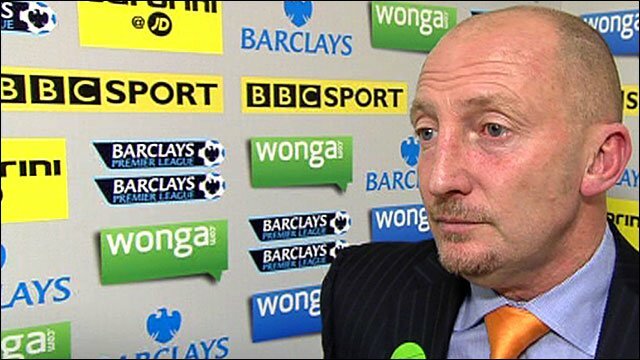 Television replays suggested Holloway had a case over all three decisions and the Tangerines boss called it "heartbreaking". He added: "They've (the officials) got to get those right. Three goals. He's (referee Phil Dowd) got three massive decisions wrong, which cost my team against one of the so-called big teams. "For me, we could have been one point behind [City] if things had gone our way, as they clearly should have done. "We're getting absolutely Bo Diddley squat, week in, week out. But there you go, such is life." Holloway's comments will again raise the question about whether technology should be used to allow officials to review crucial decisions. World governing body Fifa came under pressure to reconsider the issue when the referee failed to award England's Frank Lampard a goal in the World Cup match against Germany in the summer, even though replays showed the ball had clearly bounced behind the goalline. Fifa is now set to appoint an independent company to test the accuracy of goal-line technology systems. The issue will also be discussed at next week's business meeting of the International FA Board in Cardiff, with the likely outcome that a company will be appointed to investigate further. Holloway put forward his own suggestions for how things should change, telling BBC Sport: "The fourth official should be sat in a booth watching the action on television from all available angles. "We are judging the officials on camera angles that they have not got and we just want them to be right, so we should let the fourth official to do it. "It would not slow the game down at all. It would be a simple communication from the official to the ref, who would then tell the crowd. It is so simple." But for now, Holloway was left to stew on what might have been, while City profited from a win that came despite a below-par performance. 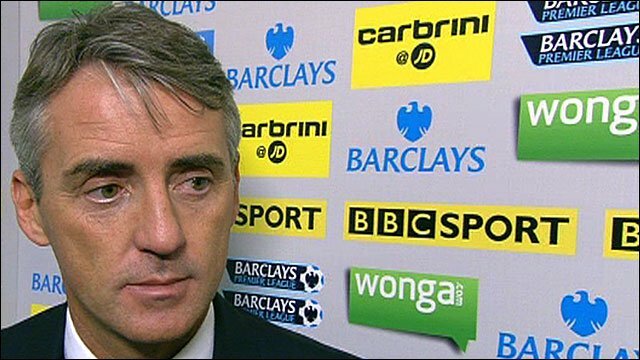 Eastlands boss Roberto Mancini admitted: "Sometimes it is important to win like we did today. We didn't play well. "It was important at the end that we scored three goals. It is not easy to score three goals away from home." The Italian added that his side "must improve" but he reserved praise for two-goal striker Tevez and strike partner Emmanuel Adebayor. "I'm happy for Emanuel, he played well for 60 minutes, but we have three games this week so I need to make changes," Mancini said. "Carlos is a fantastic player, he scored two fantastic goals and it was very important for the team."